This guest post is brought to you by the following book, which you can vote for in Cover Wars. Click HERE! While such a schedule is, indeed, hectic, I do not believe that it is in any way unique. Tens of thousands of people put in long work days—some slogging through lengthy shifts in factories or in service jobs that bring them into close proximity to the public for whom they hope to, some day, produce quality fiction. And they do—they go home, tired and frazzled, and still they manage to write. Even after sitting down to mark up over 100 essays for my students, I also compose my own stories. And unlike those popular authors such as Michael Chabon, Shirley Jackson, and Stephen King (to name only a very few), I have no children. That such individuals could work full-time, raise their families, and still produce award winning narratives means that others can do so as well. Just to be clear, the pronoun in that sentence refers to all of you who are reading this now. But how, one might ask, does anyone do so such things, and keep doing them with regularity? What secret do these writers possess? One key factor is certainly persistence, however, I know from experience that one of the most effective means to successful and continuous writing is time management. In a recent Facebook post, Joe R. Lansdale, the author of such novels as Mucho-Mojo and Bad Chili, said that one can only produce fiction by “putting in the time.” Thus, writers must stay seated in their chairs and place words on a page. Whether that’s in long hand, with a pencil and steno pad, or by mashing keys on a laptop, the dedication to the act of creation is the only way that anything gets done. Trying to budget enough time (and please note that expression) may seem a daunting proposition. Anyone who has ever written a poem, an essay, story, review, novel, etc., understands that none of it occurs instantaneously. One writes a draft over the course of days, weeks, months, or, sometimes, years. One then proof reads, edits, revises, and rewrites. The process is so off putting for some that they give up in utter frustration and turn to reading good books instead of continuing with the effort of writing their own. Now, back to having enough time… Just know that such a condition is as mythical as Narnia and Hobbiton. Not even full-time writers with six figure contracts ever feel as if they have enough time to accomplish their goals. So what can one do who is seriously interested in committing the time and effort to generate, say, a novel? If others, like me, can find enough time, how can you as well? My method may seem rather Zen-like, but I write “in the moment.” That is to say, I don’t wait to suddenly be “in the mood,” or to reach that sense of inner peace that might be necessary to other writers. I carve out a few minutes from each day by plugging in a flashdrive containing my latest work, opening the file, and getting lost in the process. Even when I know I can only devote less than half an hour to writing, I take advantage of it, because, for me, even a single paragraph is one more than I had before I began. And this is the way all busy people accomplish their dream of writing—they understand the limitations of time constraints and embrace them rather than being dissuaded. You say you can only spare thirty minutes three days a week? So be it. Then make each of those sessions count. Don’t fret over the fact that you can’t spell, or that your knowledge of ion engines and warp drive is sketchy. WRITE. Get your thoughts down on paper (or into a computer file) and worry about the rest during the editing phase to come. A paragraph a day soon leads to a chapter. Chapters build toward the creation of a novel, and voila. You’ve written a book—hooray. Lao-tzu is credited with having said that, “The journey of a thousand miles begins with a single step.” It may seem flip to say so, but whatever it is that one hopes to write, it cannot occur unless the first word is placed on a page, followed by a sentence, a paragraph, a chapter, and on until it is finished. Manage time effectively and it’s totally possible for anyone to complete a similar literary journey as well—the creation of works that others will also enjoy. G. Warlock Vance is a North Carolina writer, and professor of English. His occult mystery The Missing Narrative of Neptune (Scrybe Press) was published in print and in audio format. His non-fiction study, The Dread and Portent of Lovecraft’s Necronomicon (Pallid Mask Publishing), is a valuable addition to the scholarship of modern dark fantasy. He has a Ph.D. from the University of North Carolina at Greensboro and currently teaches American literature. 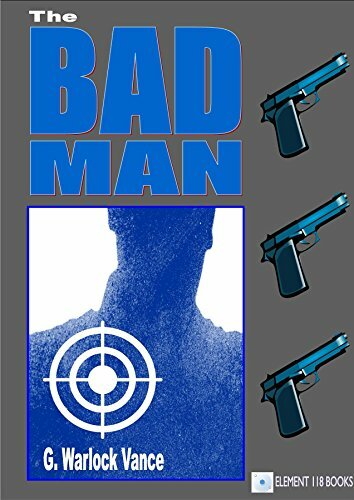 His latest novel, THE BAD MAN (Element 118 Books), is a tour de force of crime fiction and has received excellent reviews.